HADCET April 2016 was tied for 217th warmest out of 354. The barplot is the April’s since 1659. The temperature is the anomaly from the 1659 to 2016 average. The yellow bars are the years warmer than February 2016. Green bars indicate a tie with February 2016. Click twice for bigger. HADCET (Central England Temperature) Longest temperature record in existence. HADCET March 2016 was tied for 143th warmest out of 355 at 5.8C. The warmest March was 1957 at 9.2C. The barplot is the Marches since 1659. The temperature is the anomaly from the 1659 to 2016 average. The yellow bars are the years warmer than March 2016. Green bars indicate a tie with March 2016. Click twice for bigger. You remember the hoopla about February 2016 being the hottest of all time? HADCET February 2016 was tied for 106th warmest out of 354. The barplot is the Februaries since 1663. The temperature is the anomaly from the 1663 to 2016 average. Paul Homewood discusses BBC claims that Heatwaves are more likely due to climate change. And because 2014 was the “hottest” year. 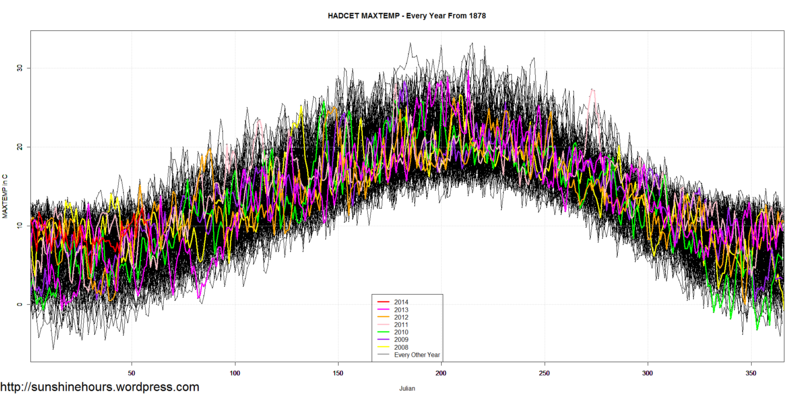 So I decided to look at the HADCET MAXTEMP data. Not the average. The maximum. I then arbitrarily set the heatwave boundary at 25C. And then calculated the number of days over 25 and the longest stretch (ie Heatwave). What if I set the Heatwave definition at 30C? There are only 8 years that have days over 30C. The 30C days and temps. Will Britain Enjoy Fewer Cold Days Thanks To Global Warming? No. A new “study” is out. “Britain will have fewer days of ‘extreme cold’ and will enjoy milder winters as a direct result of climate change, according to a new study. In these cases I like to turn to HADCET Daily Minimum data which is available from 1878 on. And I thought I would look at the number of days that the minimum was lower or equal to 0C for each year. Wow. 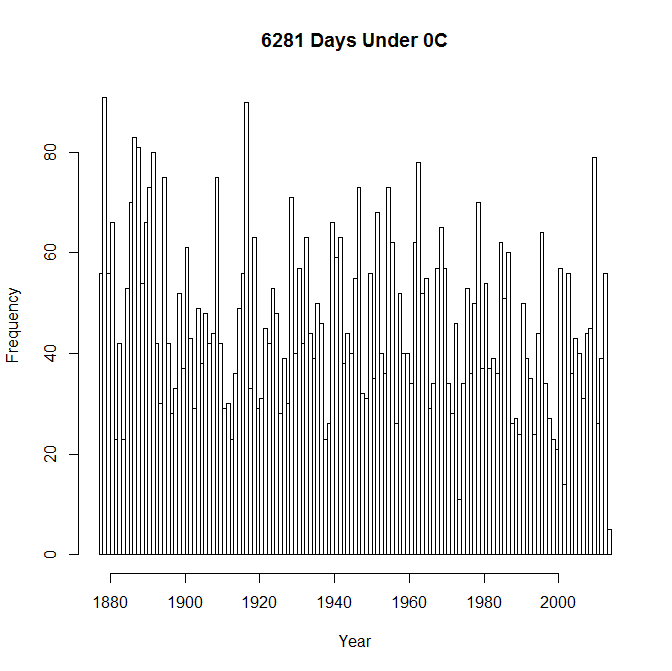 2010 had the 6th highest number of days that were 0C or colder. So much for “Global Warming”. What about equal to or less than -5C? Wow! 2010 was 2nd highest with 21 days. HADCET Daily Maximum data is available from 1878 on. 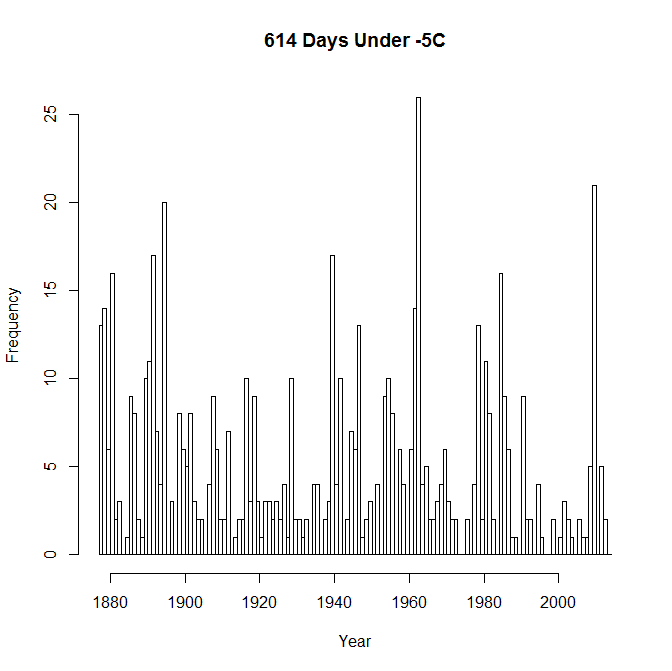 Here is every day from 1878 on visualized using the same style I use for Sea Ice Extent. The most recent years get a color. It doesn’t look like the end of the world is happening … does it? Click graph for bigger.